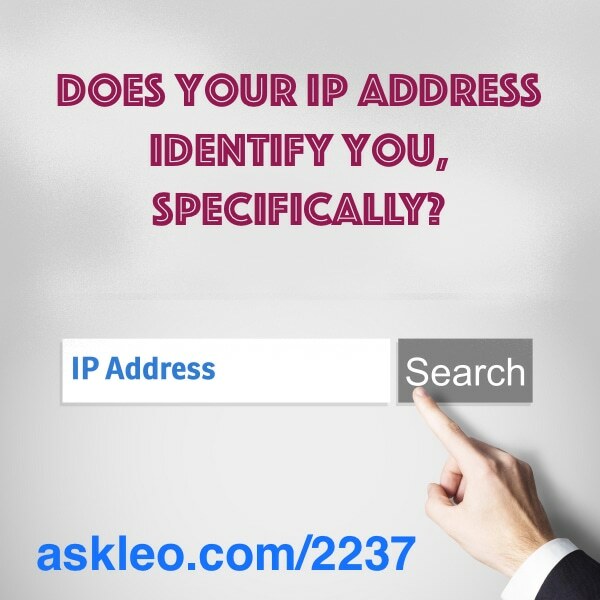 Does your IP address identify you, specifically? - Ask Leo! Does your IP address identify you, specifically? When I Visit a Web Site, Can the Server Identify Me? - Minimally, web servers get your IP address when you visit. Whether or not that or other information can actually be used to identify you, specifically, depends on a lot of things. How does a site identify me when I am using a VPN? - There are lots of modules and widgets available online that help websites appear to identify who you are. Your VPN isn't involved at all. How do I extract and identify the music in a Powerpoint presentation? - You may not be able to extract music files from a Powerpoint presentation that is not editable. However, there is an amazing way to find out if that song is available to download. « Previous post: How Do I Delete My Facebook Account?